This post is part of a sponsored campaign with Cepia LLC and MomSelect. All thoughts and opinions are my own. The Happy’s work with both a play ball which they push around and jump on and a treat which they will follow around the room with. The Happy’s can interact with each other so if you have two or more they’ll play together. 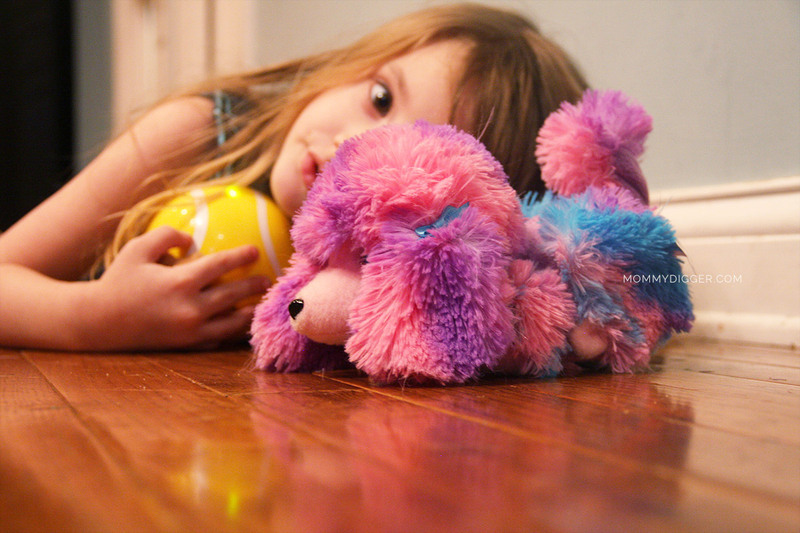 My girls love chasing and playing with their Happy’s pet. It’s like they are playing with a real pet. There are many different Happy’s and we received one of the new colored The Happy’s pet, interactive treat and chase & play ball. Happy’s need 2 AA batteries to run and the Happy’s Chase And Play Ball requires 3 AAA batteries. The Happy’s do best playing on hard floors. Tile, wood, concrete, all work well, but not carpet. Each pet comes with a different trick. Some examples are pounce, chase wiggle and beg. Each treat teaches a different trick so collect them all and teach your pet all different tricks! There are also cars for them to drive in available separately. My girls have a blast with theirs and I actually got them another one for Christmas so they watch them interact with each other. The Happy’s are available at retailers everywhere including Toys R Us, Wal-Mart, Target, Radio Shack and Amazon. They retail for $19.99.